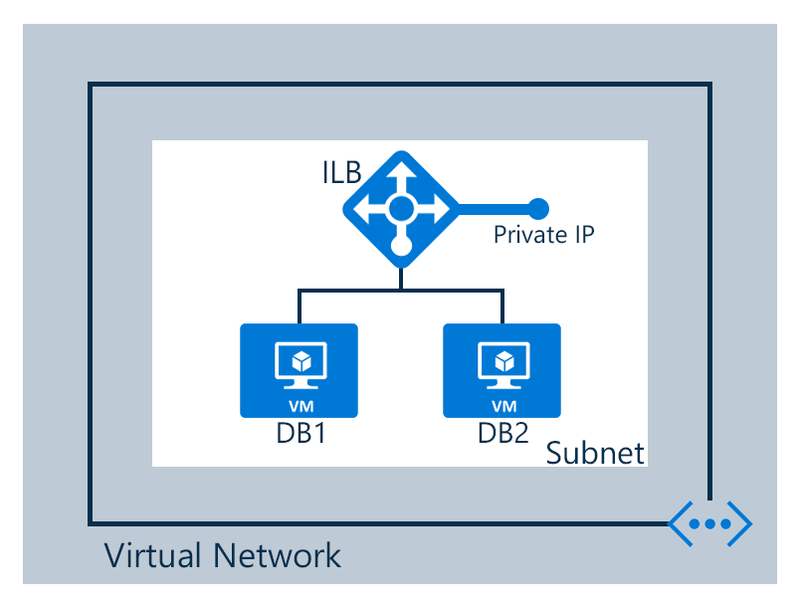 Azure Internal Load Balancer (ILB) provides network load balancing between virtual machines that reside inside a cloud service or a virtual network with a regional scope. For information about the use and configuration of virtual networks with a regional scope, see Regional virtual networks. Existing virtual networks that have been configured for an affinity group cannot use ILB. To perform the steps in this article, you need to install and configure the Azure PowerShell module. Be sure to complete all of the instructions. After the installation is finished, sign in to Azure and select your subscription. You need an Azure account to complete these steps. If you don't have an Azure account, you can sign up for a free trial. This article explains how to create an internal load balancer by using Azure Resource Manager with the Azure PowerShell module. In the Resource Manager deployment model, the objects that are needed to create an internal load balancer are configured individually. After the objects are created and configured, they are combined to create a load balancer. Front-end IP pool: The private IP address for all incoming network traffic. Back-end address pool: The network interfaces to receive the load-balanced traffic from the front-end IP address. Load balancing rules: The port (source and local) configuration for the load balancer. Probe configuration: The health status probes for virtual machines. Inbound NAT rules: The port rules for direct access to virtual machines. For more information about load balancer components, see Azure Resource Manager support for load balancer. The following steps explain how to configure a load balancer between two virtual machines. Make sure you have the latest production version of the Azure PowerShell module. PowerShell must be correctly configured to access your Azure subscription. Start the PowerShell module for Azure Resource Manager. Check your available Azure subscriptions. Enter your credentials when you're prompted for authentication. Choose which of your Azure subscriptions to use for deploying the load balancer. Select-AzSubscription -Subscriptionid "GUID of subscription"
Create a new resource group for the load balancer. Skip this step if you're using an existing resource group. New-AzResourceGroup -Name NRP-RG -location "West US"
Azure Resource Manager requires that all resource groups specify a location. The location is used as the default for all resources in the resource group. Always use the same resource group for all commands related to creating the load balancer. In the example, we created a resource group named NRP-RG with the location West US. Create a subnet for the virtual network and assign it to the variable $backendSubnet. The virtual network is created. The LB-Subnet-BE subnet is added to the NRPVNet virtual network. These values are assigned to the $vnet variable. Create a front-end IP pool for the incoming traffic and a back-end address pool to receive the load-balanced traffic. Create a front-end IP pool with the private IP address 10.0.2.5 for the subnet 10.0.2.0/24. This address is the incoming network traffic endpoint. After the front-end IP pool and the back-end address pool are created, specify the rules for the load balancer resource. An inbound NAT rule for the Remote Desktop Protocol (RDP): Redirects all incoming traffic on port 3441 to port 3389. A second inbound NAT rule for RDP: Redirects all incoming traffic on port 3442 to port 3389. A health probe rule: Checks the health status of the HealthProbe.aspx path. A load balancer rule: Load-balances all incoming traffic on public port 80 to local port 80 in the back-end address pool. After creating the internal load balancer, define the network interfaces (NICs) that will receive the incoming load-balanced network traffic, NAT rules, and probe. Each network interface is configured individually and is assigned later to a virtual machine. Assign the NIC to a virtual machine by using the Add-AzVMNetworkInterface command. For step-by-step instructions to create a virtual machine and assign the NIC, see Create an Azure VM by using PowerShell. After the virtual machine has been created, add the network interface. Store the load balancer resource in a variable (if you haven't done that yet). We're using the variable name $lb. For the attribute values in the script, use the names for the load balancer resources that were created in the previous steps. Store the back-end configuration into the $backend variable. Store the network interface in another variable. This interface was created in "Create the network interfaces, Step 1." We're using the variable name $nic1. Use the same network interface name from the previous example. Change the back-end configuration on the network interface. Save the network interface object. After the interface is added to the back-end pool, network traffic is load-balanced according to the rules. These rules were configured in "Create the configuration rules, probe, and load balancer." Use the optional -Force switch to prevent the confirmation prompt for the deletion.